Register online through October 17th. Register race day beginning at 7:30am. October 18th and 19th from 10am - 2pm at Georgia Arrhythmia Consultants, 639 Hemlock St Macon, GA, Suite 100 (upstairs), or race day at race site beginning at 7:30am. Age group awards 3 deep as follows: 10 & under, 5 yr ages groups thru 75+. All race entrants will receive a technical fabric T-shirt as supplies last. 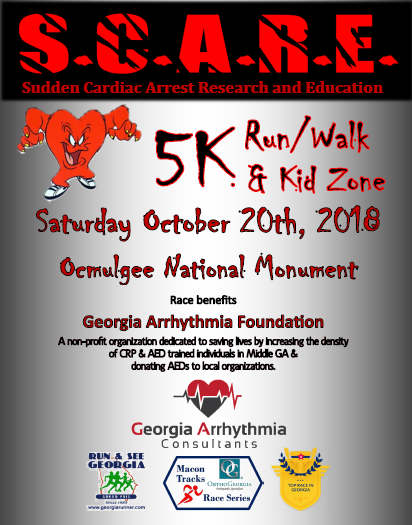 Georgia Arrhythmia Foundation, a non-profit organization, hosts this annual event to increase community awareness of sudden cardiac arrest (SCA) and support the need for automated external defibrillator (AED) placement in schools and other public places as well as community education regarding basic life support (BLS) training. To date over 40 AEDs have been donated to our community! Visit www.scare5k.com or contact Brianna Wolfe at bwolfe@gacri.com or (478) 703-0399.